We’ve never felt nervous about cooking meat before. But I have a jitter in my belly about our dinner next week on Wednesday May 31st because we will be cooking some really special meat. All meat should be special though, right? Meat was once a living, breathing thing, a lot of the time with a personality and intelligence. But unfortunately we don’t see or care about this MOST of the time. And this simply comes down to the fact that we have no connection to the animal or where it has come from. We don’t see it in its living state and only associate with it moving from a plastic wrapping to an oven or grill. The pork that we will be cooking on Wednesday comes from pigs that we have had a very close relationship with for the last six months, and the nervousness comes from a worry about not doing it justice. We are welcoming these new feelings very enthusiastically as they may lead us to eat less meat in general. 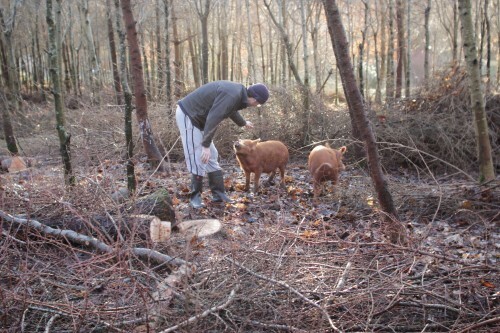 These rare bread tamworth pigs have spent the last eight months on ten acres of oak forest in Westmeath and we can wholeheartedly say that they are incredibly happy pigs. 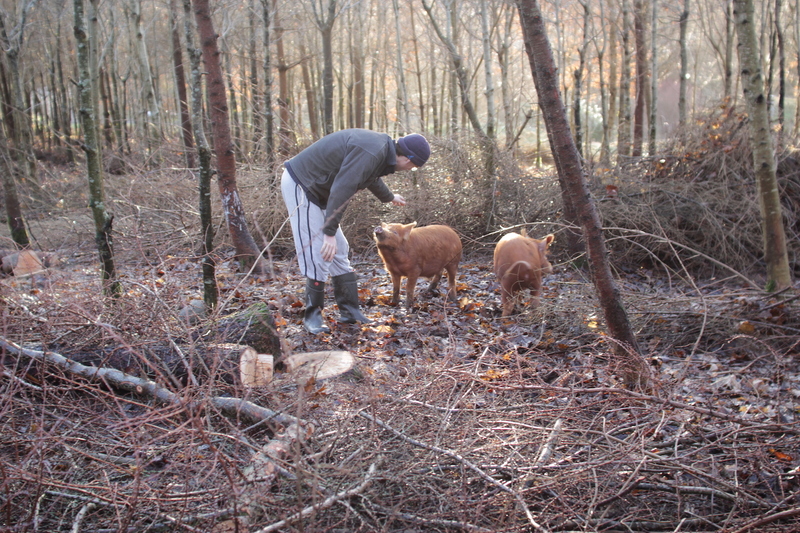 As we have been there feeding them, finding them in the woods and giving them ear rubs in the sun. 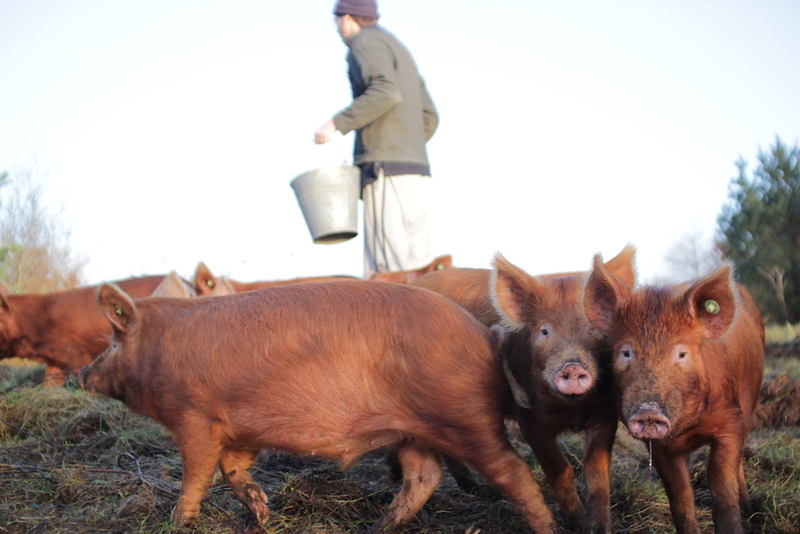 Tamworths are very sociable pigs with a healthy dose of curiosity, which means they are constantly finding holes in the fence and inventive ways to escape and explore the neighbours fields. A lot of hassle but very likeable. They don’t gain weight as quick as commercially bred pigs and generally have a far leaner meat which is renowned for being exceptionally flavourful. We have from time to time brought them down leftover bread and cakes from the cafe and have gotten to know them, their habits and their quirks. Having this connection changes everything. It changes how you want to treat the meat, who you want to share it with and how to essentially do the right thing with it. What is the right thing? Probably not eating meat in the first place, some might say. And I wouldn’t be totally in disagreement with them. 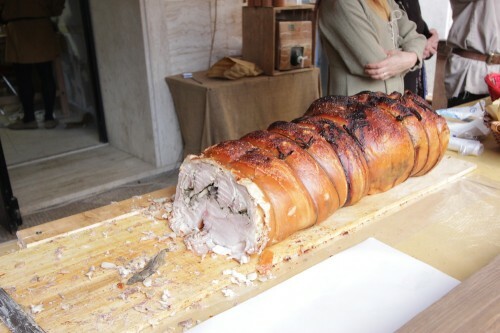 But if we are going to eat meat, it should be in this way. Being connected to the full lifespan of the animal and using every last piece of the meat sparingly once it has been killed. Having the direct connection to the farmer we have the opportunity to buy full carcass and to do our own butchering. Aside from the porchetta dinner we will be doing some of our own curing and sausage making and including the remaining cuts into our daily specials in the cafe. Everything will be used. Head, trotters, offal….nothing will go to waste. You can see the menu for the Porchetta dinner here, and we will also be selling slices of the meat on the night for take home, as they would traditionally do in Tuscany. 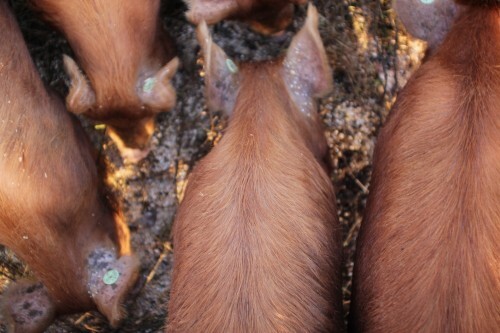 Nose to tail is a term that everyone is familiar with these days, and if anyone wants to avail of the opportunity to be a part of this cycle then please get in touch with Manchán directly here. He still has some allocation of meat available for this years pigs. And may also be interested in taking bookings for the next brood coming up after the summer. The pigs are fully registered and Bord Bia approved.